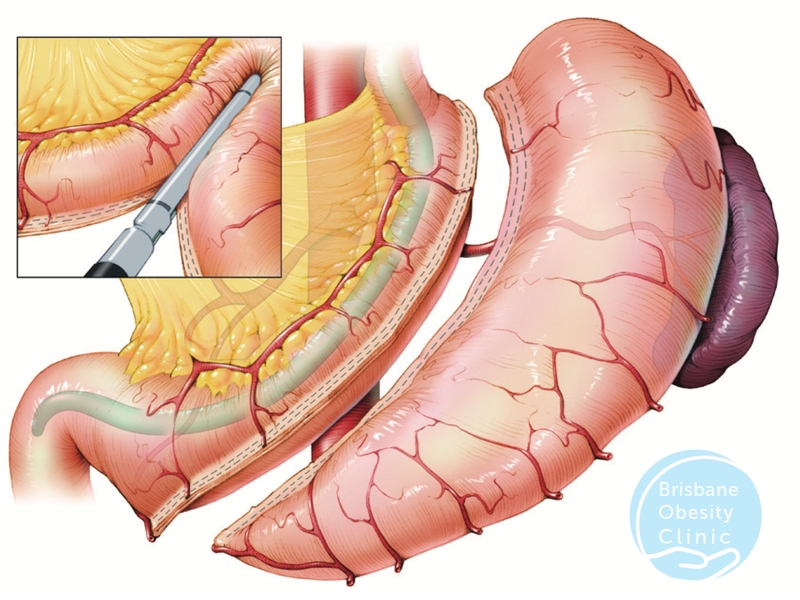 The Sleeve gastrectomy (also known as the Gastric Sleeve) procedure involves using staples to create a long tubular sleeve of stomach along the lesser curve side of the stomach with the remainder of the stomach, including most of the fundus & the body of the stomach, being removed permanently. The new, long & thin ‘sleeve’ of a stomach is smaller than the original stomach, restricting the amount of food that it can hold, & so promoting weightloss. The major effect of the procedure is to remove the part of the stomach that secretes Ghrelin, a hormone that plays a major role in determining how hungry we get. As people lose weight the stomach starts to produce an increased amount of Ghrelin that tells the brain to increase appetite. Patients who have had Gastric Sleeve surgery generally have a greatly reduced appetite & as they lose weight they do not suffer the hunger pains experienced by dieters. Research indicates the Sleeve Gastrectomy appears to cure or improve type 2 diabetes, sleep apnoea and hypertension. This procedure is performed via key hole surgery which is less invasive. The Sleeve has a high satisfaction rating with patients as it is possible to eat all types of food, just in smaller portions. There is no need for regular adjustments, unlike the Lapband. The advantage of Sleeve Gastrectomy over the other restrictive operations is that with the Sleeve Gastrectomy the whole gastric tube fills when eating so patients feel full rather than obstructed. As the Sleeve Gastrectomy does not have a band, there are not many food intolerances in the long term. Cost of the Sleeve Gastrectomy? Initial Dietitian appointment of $145 which is claimable through health fund extras cover. For all other procedural prices, please refer to links below. Studies indicate patients can lose up to 70% of excess weight within the first 3 years of having a gastric sleeve. Alternatively, head to our Facebook page ‘Brisbane Obesity Clinic’ to see photos, reviews and more! What is the waiting time for this procedure? There is currently no wait time for the gastric sleeve surgery for patients who are wanting their procedure done as soon as possible. Patients will only need to allow enough time to commence their mandatory pre-surgery diet, this is usually of 2 weeks duration and varies according to BMI. In most cases we can get patients in for the sleeve gastrectomy within the month following their initial consultation with Dr Adib. Patients who are going through superannuation can generally book as soon as 10-12 weeks. The Sleeve surgery is a two-night stay at the Wesley Hospital. Estimated recovery time for the Gastric Sleeve is usually up to 2 weeks, however, each patient is different. This is something that can be discussed with Dr Adib at the time of your consultation. Where is the Sleeve Gastrectomy performed? Dr Reza Adib performs the Sleeve Gastrectomy in Brisbane at the Wesley Hospital. This procedure entails a minimum of two-night stay at the hospital. You will be required to see one of our dietitians prior to surgery to go through your dietary requirements. The dietitian is conveniently located in our rooms at the Wesley Hospital and they are also available for phone consultations. You will be required to see either dietitian 3 times post surgery, this is to go through your change of diet. You will receive 12 months of complimentary appointments following your procedure. What is the cost to see the Dietitian? An initial Dietitian consultation is $145 and is claimable through Private Health Extras. The patient will receive a 12 months Dietitian Program post surgery included in their weightloss package. Patients do not require to see any specialists prior to this procedure unless deemed necessary by the surgeon.